second generation kindle | FreshTech. As tempting as Amazon.com’s kindle is, it’s probably wise to wait for the second generation model before you buy. But then again, no one knows just how long it will be before the second version appears. One would expect, however, that this first-generation device should be significantly better in its second iteration. And, it is highly likely that this new model will address the monochromatic screen, PDF file display limitations, the clumsly “Next Page” and “Previous Page” buttons, the limited wireless coverage, and the seemingly high-$399 price tab (a $250 and $300 seems more reasonable). Introduced in November, Kindle allows you to wirelessly download e-books from Amazon.com using Sprint’s 3G (EVDO) network as long as you are in a whispernet “hot spot.” No contracts or fees are required to use the network. You can also pay to subscribe to Kindle-compatible versions of newspapers, magazines, and blogs, which of course you can automatically downloaded in under a minute. You can also add your own notes, highlight text, clip text, search for a particular text or reading, and search for numerous words in its built-in dictionary. The kindle store is already huge: over 90,000 books and still expanding. So, do you wait on the next generation or do you get a copy now? The answer depends on you. What are you looking for in a wireless electronic reader? Even with all its shortcomings, Kindle already offers more than many of it predecessors. It’s wireless capability alone changes the game. Not to mention its already wide array of content genre. I am excited just thinking about it. And this is just first generation. Just expanding it wireless tentacles, increasing its content capacity, adding touch screen, and adding a language component will be a vast improvement. So, you know what, I did not wait. I wanted to be a part of the revolution now! Perhaps you are different…a perfectionist, I might add and that’s okay. Everyone is different. Just be careful, however, that you don’t miss out on the “real” reason why Kindle is here. You might just be missing out on a “ride” that’s about to be around for a while. 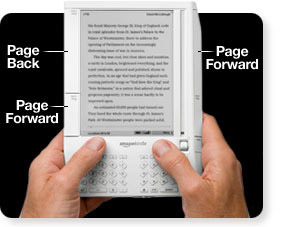 To be honest with you, I think that the “eReading world” need a device such as Kindle. Because like it or not, believe it or not, the way we read will change. Its really just a matter of time. So, If you choose to wait for the second generation Kindle, who knows, how long you will be waiting. If, on the other hand, you buy now, at least you will begin to enjoy the features of a revolutionary device that has already open our eyes to another way to read just about anything we want, whenever we want, and wherever we are on the planet.